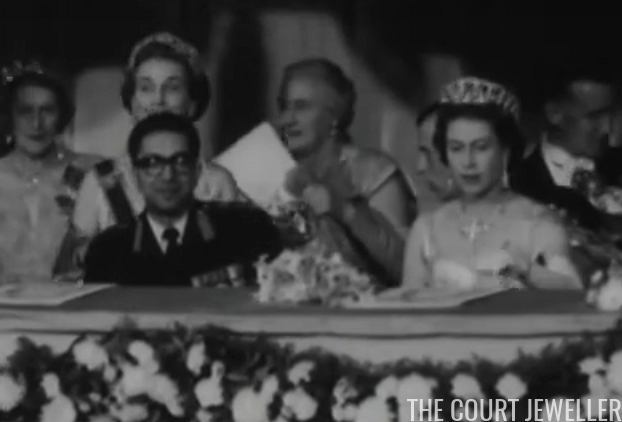 Today's clip, a bit of newsreel footage from the 1960 state visit from Nepal to the United Kingdom, is full of glitter from an evening at the opera house in Covent Garden. Numerous members of the British royal family are pictured here, many of them wearing very familiar pieces of jewelry. (How many can you identify?) The Nepalese royal family is also decked out in diamonds. King Mahendra and his wife, Queen Ratna (whose name literally means "jewel"), reigned in Nepal until his death in 1972. Queen Ratna is still alive today -- she survived the horrific massacre of the royal family in 2001, and although Nepal's monarchy was later abolished, she still lives on the grounds of the royal palace.